Difference between revisions of "Parachute"
'''Parachutes''' are parts that when deployed slow down the speed of a [[craft]] in an [[atmosphere]] by creating drag. In [[career mode]] this allows to [[Recovery|recover]] craft landed on [[Kerbin]] which returns [[funds]]. Parachutes are parts that when deployed slow down the speed of a craft in an atmosphere by creating drag. In career mode this allows to recover craft landed on Kerbin which returns funds. While in theory it is possible to recover boosters like the Solid Rocket Boosters of the Space Shuttle with parachutes, it's difficult in practice because all craft without command modules outside the 2.5 km sphere around the controlled craft while in the atmosphere are removed. The timing has to be so that the circularization of the orbit with the main craft is not while the boosters are in the lower atmosphere. 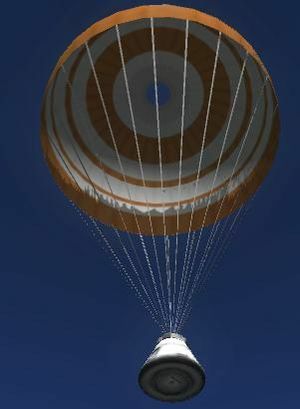 Parachutes are used on bodies with atmospheres such as Kerbin and Eve to slow the craft for a landing. The deceleration depends on both the mass of the craft and the density of the atmosphere. Therefore craft that are either very heavy or land on bodies with thin atmospheres (Duna, Laythe) require either multiple parachutes or additional engines for a soft landing. 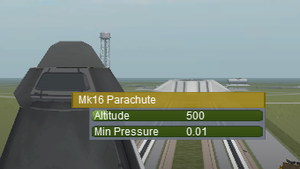 Parachutes can also be used to aid with aerobraking to create additional drag. On the other hand, a heavier parachute part generates more drag than a lighter parachute. Parachutes can also be used to help stop space planes as they land. Parachutes require a minimum air pressure to deploy, so they will work neither in higher parts of atmospheres nor in a vacuum (see Deployment). In addition, parachutes are cut automatically on the ground and can't be used, for example, to aid in slowing a landing aircraft once it's already on the runway. The part's mass isn't affected when the parachute is cut. A deployed parachute will cut automatically during descent if propulsion is used to increase vertical speed past zero. A deployed parachute can also be cut manually (right-click on parachute and executing Cut Parachute). Once cut, they can be repacked on EVA by a level 1+ engineer. (To do this, right-click on the parachute and click Repack Chute.) Repacked Parachutes can be deployed like fresh ones, although the staging sequence must be reordered to be able to stage them normally. Changes were made to the staging icons in version 1.0.5. The staging background colour now indicates whether or not it is safe to deploy the parachute, being light grey when safe to deploy or at rest, a yellow-green colour to indicate that deployment may be risky (at around 250 m/s on Kerbin for main parachutes, nearly twice this speed for drogues) and dark red at any higher speed. The foreground colour (i.e. the colour of the parachute itself) indicates the state of the parachute, starting at white (unstaged/undeployed) and running through cyan (released but insufficient pressure to semi-deploy), yellow (semi-deployed), green (fully deployed) and bright red (destroyed). A cyan parachute on a red background is therefore a highly undesirable combination since it means that the parachute has been released at too high a speed and will be destroyed as soon as air pressure is high enough for semi-deployment. Recovery will only be possible by slowing before air pressure rises, or (if time permits) by right-clicking the parachute to disarm it. Accidentally staging the parachute in space is therefore recoverable via the part's right-click window. Altitude (50-5 000 m) - The full deployment's altitude above ground level. Min Pressure (0,01-0,5 atm) - The semi deployment's pressure threshold. There are currently five options for parachutes. Parachutes semi-deploy at a specific atmospheric pressure. which is situated in different altitudes on different bodies (rough semi deployment altitudes are shown below). Contrastingly, full deployment occurs depending on height above ground, not pressure. Deployment altitudes and pressures of various parachutes can be found in the above table. Before version 0.18 the image shown in the part selector of the VAB and SPH showed the parachute deployed. Since then all parachutes are shown stowed. This page was last edited on 20 January 2019, at 02:46.